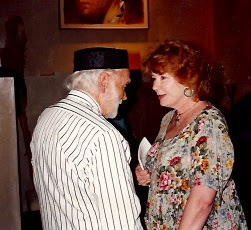 I met Sally in the summer of 1994. my friend James Broughton was visiting Santa Fe. one nite another friend threw a big party for him at which "The Bed" was screend. Sally was there with her housemates at the time -- John & Karen Ericson. I took this picture of her with James. she had a long career both on stage as well as in film & tv. one of my favorite roles of hers was in Tony Richardson's "A Death in Canaan." it was such a small part that all of it is in this You Tube clip. but as you can see she makes such an impression you remember her thru the whole film -- & even after. when she left Santa Fe to reboot her career in NYC she had a yard sale. I helpd. & for that she gave me some items that didn't sell -- including a large pot & a throw given to the crew of "Cagney & Lacy." every time I use them I think fondly of her. in addition to the spark she always brought with her I'll also never forget that she was the one who introduced me to Bernique Longley. I've written abt that before but it deserves retelling. 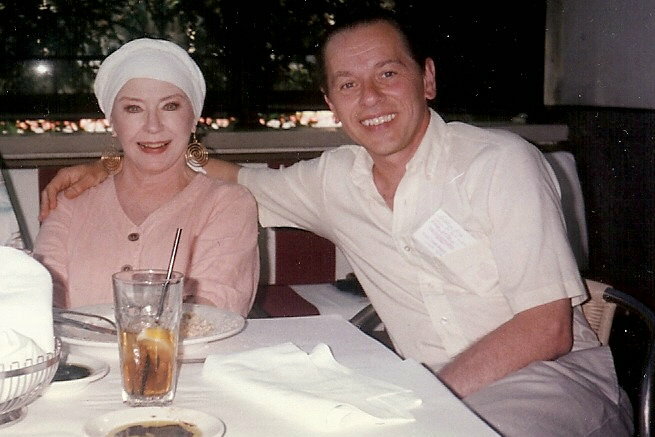 she knew both me & Bernique well enuf to know we'd adore each other. it says so much abt Sally that she was able to share friends in such a lovely way. last nite I went to the gathering of One Million LGBTQ in Action. this Palm Springs contribution to the nation-wide protest against the "president" was feeble bbut heart-felt. 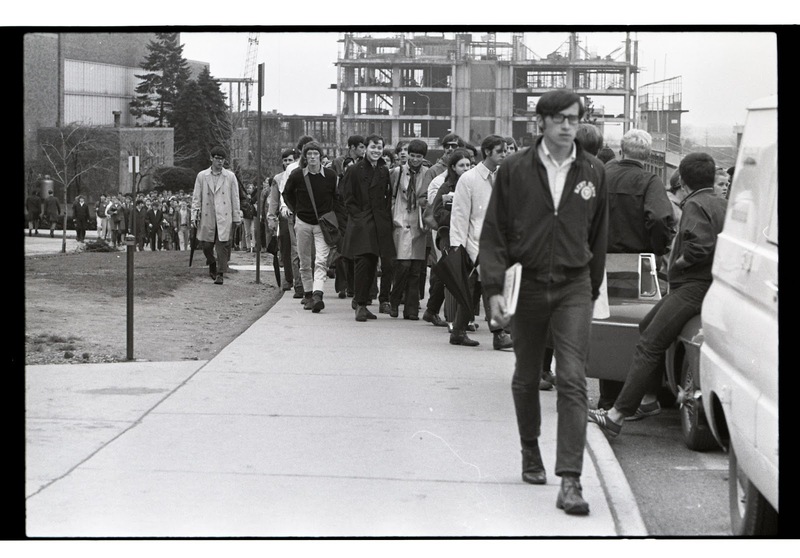 then this morning Judith Gollust King sent me another of her remarkable photographs documenting the history of Kent State University. I must say I look all too dapper for a protest march. but there I am -- flanked by Patrick Cullie & Peggy Freemon. Judith thinks this was taken on 21 apr 1969. the crowd looks robust. the first time I was in a protest was as a child when I joind my striking father to picket General Industries. hard to believe it'll celebrate its half century mark this year. & harder still to know that I had a poem in its pages 47 years ago. I know someone in town who lives in the house that once belongd to Hedy Lamarr. we may be doing something together tomorrow. so he was on my mind. & as my mind is it weaves hither & yon with comfort & ease. & a tale returnd to me. I had a redneck uncle who had a sister who smoked. I disliked her. once she was visiting Winckles St & in the course of her rambles she lookd me in the eyes & utterd in a slightly desultory manner "I remember when you were a boy & dressd up like Hedy Lamarr." I was startld because I have zero memory of doing drag as a child (except at Halloween). but I was not to be one-uppd by a hillbilly. so I quickly responded: "you're wrong. it was Betty Grable." then I stood up turnd my back to her put my hands on my hips & lookd over my shoulder with a glower for the ages. everyone is talking abt the "super bloom" brought on by all our winter rain. so some of us went to Borrego Springs today to see what it's all abt. welllllll... it's just beginning. I suspect it'll be in fuller glory in another week. but I was happy to be introduced to the desert lily. also the Ricardo Breceda sculptures are fun. here I am with a section of his "Sand Serpent" (2011). "Circle of Land and Sky"